I am a lucky person. The British Academy recently awarded me a Mid-Career Fellowship for 2014-5, allowing me to work on a project on my long-standing research interest, Latin inscriptions in verse or, as they are more commonly called among us ‘carminatores’, the Carmina Latina Epigraphica (or, shorter still, the CLE). Certainly, in the vast stream of Latin inscriptions that survived antiquity, the CLE are but a small island: approximately 0.5–1% of all Latin inscriptions were composed in verse. In the context of Latin poetry, however, their importance must not be underestimated: they add several thousands of epigrams – complete or fragmentary, from a wide range of diverse authors, across time and space in the Roman empire – to the body of literary poetic texts that underwent a manuscript transmission and that more commonly catch the attention of Classical scholars. Over the next year or so, I will present examples of this genre and related discoveries on my blog, to share my enthusiasm with a wider audience and to promote this remarkable collection of texts. To commence this series, I would like to present a little-known poem by the 4th century Gallic poet Decimus Magnus Ausonius. littera, praenomen sic <.L.> nota sola facit. hic iaceat, certis nouerit indiciis. mors etiam saxis nominibusque uenit. One letter, indeed, yet it shines embedded in between two points: thus makes a single sign, •L•, a first name. After that an •M• has been carved, as follows, •^•, I think, one cannot see it in full: the top is mutilated and came off due to a fracture of the stone. Consequently, no one will be able to know from unambiguous evidence whether it is a Marius or Marcius or Metellus who lies here. Distorted lie the letters, with truncated shapes, everything died as a result of the mangled signs. Should we be surprised that people die? Monuments languish, and death even comes to stones and names. Hirschfeld even added a D(is) M(anibus) (‘To the Manes‘) as an (arguably) lost initial part of the inscription – no doubt in an attempt to account for the dots that, according to Ausonius, surrounded the abbreviated first name (instead of just one dot following it, as one would expect if L(ucius) were indeed the first word of such an inscription). 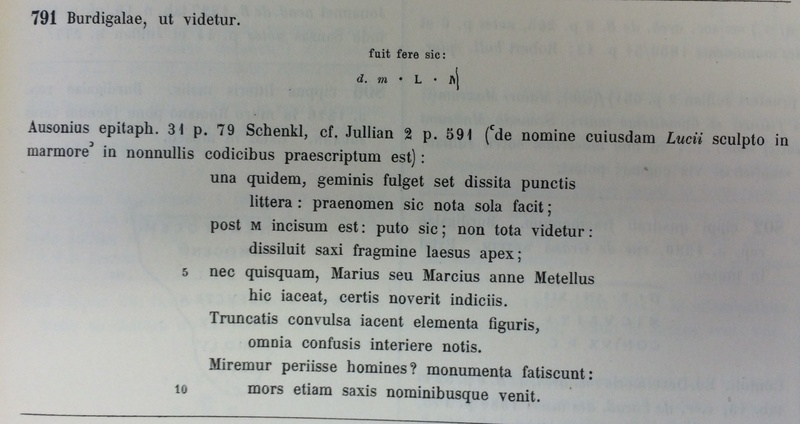 Whether or not one would like to see Ausonius’ poem as evidence for an actual inscription (or as a mere literary imagination), the text manages to combine two essential aspect of Latin epigraphy. It is testament to an unbroken desire to make sense of fragmented texts (in that regard, Ausonius’ description, albeit poetic in nature, does not actually diverge much from the technical prose of the volumes of the Corpus Inscriptionum Latinarum). In addition to that, the text– all too quickly dismissed as ‘trite in its conclusion of the decay of stone as metaphor for the ephemerality of man’ by Nigel M. Kay in his otherwise immensely useful and thorough commentary on Ausonius (p. 153) – invites study of the world of popular thought of the Roman Empire: a world in which the fear of being forgotten after death has been expressed many a time. 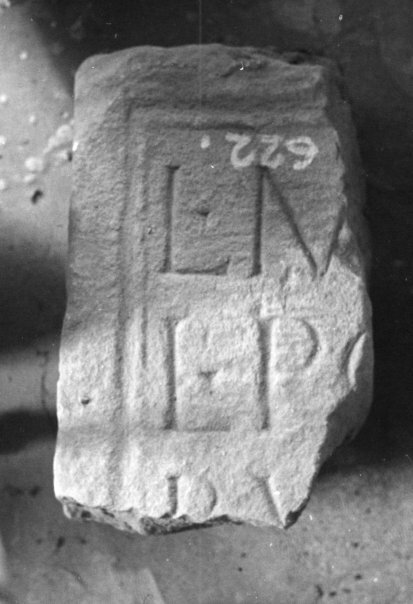 An illustrative example of that, randomly chosen from a wide range of texts, is the funerary inscription for Ennia Fructuosa from Lambaesis in the Roman province of Numidia (now Tazoult-Lambese, Algeria). This writing now declares what testifies to the life that has passed. For that is what is the ultimate solace in death, where eternal memory of the name and the family is preserved. Ennia Fructuosa lies here, dearest wife, of unique modesty and good towardliness, a praiseworthy matron. In the fifteenth year, she accepted the appellation of a married person, with which she was not allowed to live for more than thirteen years – she, who was not granted a fate of death that she deserved. Spellbound by magic charms she lied there for a long time, mute, so that her life breath wound its way out by force rather than to be restored to nature. The Manes or the heavenly gods will avenge the crime that has been allowed happened. Aelius Proculinus himself erected this monument, tribune of the great legio III Augusta. This text, written in a form that blends Latin prose with less-than-perfect hexameters and senarii, purportedly written by a military tribune named Aelius Proculinus, is not only an expression of heartfelt love of a man who lost his wife too soon (and who gives an idea of his values and his views on life and death in general): it gives an idea of the concerns of Roman(ised) people in second and third century North Africa, their fear of death in a world that partly can only be explained in terms of magic and ritual – and their fear to be forgotten, unless their names and lives are recorded in lasting monuments. To me, and for my new research project, however, the text is also an expression of something else. It is an example of what I would like to call ‘poetry of the people’: a text (allegedly) not written by a poet, but by a member of a society that, in certain contexts, valued poetic and poeticising works of art and put those on display; a text that tells a highly personal story, to commit it, along with its views and values, to an uncertain afterlife; a text that obfuscates any clear-cut lines between high art and pedestrian craftsmanship; a text that is hard to classify as either prose or verse. And yet, a text that, quite undeniably, deserves to be listened to, with the side-effect that the death that ‘even comes to stones and names’, as Ausonius had put it, will be stalled for a little bit longer. This entry was posted in Carmina Epigraphica, Epigraphy, Poetry and tagged Ausonius, Carmina Latina Epigraphica. Bookmark the permalink. 6 Responses to Remember Lucius M-whatsisface?